A quick status update: Dredmor should be getting a second patch – 1.0.10 – this Thursday, or – worst-case scenario next Tuesday. (I’m not releasing patches on Fridays any more. Once bitten, twice shy.) 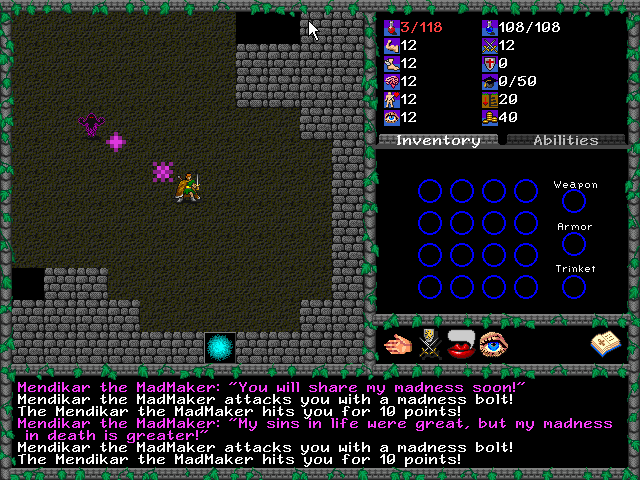 This will be going to Steam, Desura, and the HIB simultaneously, so everybody will finally be up to date. This fixes the bookshelf crash, the weird loading of saves related crashes on OS X and Linux machines, and adds a few cosmetic niceties (working magic reflection, remembering what mods are loaded, remembering if you have disabled click-to-move, random boss monsters occasionally having additional magic resistance, that kind of thing) that have been on people’s lists for awhile. 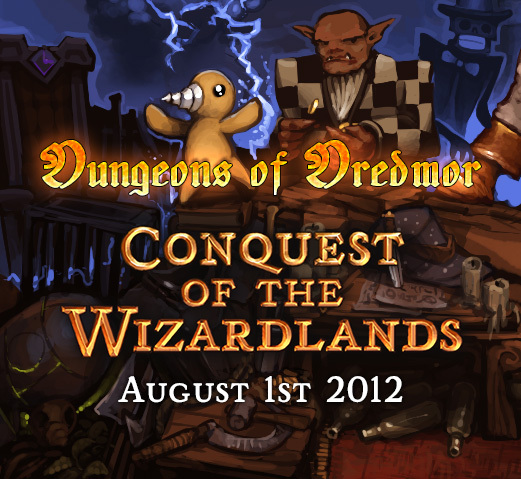 We’re still working on Dredmor, and that price post and distributor announcement is coming, I swear. While you wait, though, why not take Inaria out for a spin? It costs the same amount as Dredmor will – $4.99 – and while it’s not a roguelike, I find myself instantly remembering what it was like to be… six, seven? … and playing Ultima: Quest of the Avatar on the original Nintendo Entertainment System, desperately wanting to make RPGs, and not just any RPGs but the RPGs I saw in my head. 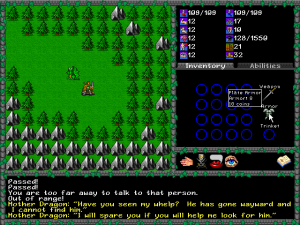 I suddenly remembered working with the DC Games RPG Toolkit – a very early, shareware toolkit for making Ultima-style games, sort of what RPG Maker might have been like if it was written in 1987 by a bunch of Europeans who had never even heard of Final Fantasy – and trying to shoehorn whatever I wanted to achieve – whatever that was! – into a program that was clearly not designed to accommodate my grand, nebulous vision. The dark secret of retro gaming is that when you revisit these old, early giants of your youth, they’re never as good as you remember them being. They’re slow, sludgy, grindy, full of filler and stodge, and ultimately an exercise in patience and frustration that we all played because it was perfectly okay to play a game where you had to make maps with graph paper. This is where Inaria comes in: it’s the game we all remember playing, and not the game that we actually played with all of its faults and limitations. For five dollars, you owe it to yourself to remember what it was like to be five. Me? I find myself remembering why I started doing this, which is a very easy thing to lose sight of when you’re working on a game and it feels like it will never end. 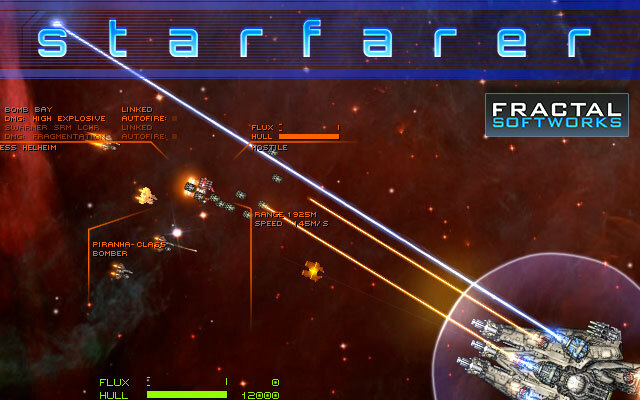 Official Friend-of-Gaslamp Alex Mosolov just released the first alpha of his indie space-combat/rpg/sandbox game “Starfarer”, now available to customers who pre-order the game (at half price!). Congratulations to Alex for shipping this release! There is some Gaslamp involvement with Starfarer, I should add: All graphics were done by myself (David) and SF’s sound was made by our own Mr. Matthew Steele (who made all the sound and music for Dredmor). I want to thank Alex for having me work on his game – it’s incredibly fun to draw spaceships and planets and it’s been a project I’ve wanted to do since I was 10 years old. It should be said also that in part Alex has made Gaslamp Games and Dredmor possible by hiring me to work on his game. We also owe a lot of thanks to Alex for helping us test many painfully early in-development versions of Dungeons of Dredmor. So best of luck to him on sales and the future of Starfarer and Fractal Softworks! You can pre-order Starfarer from the Fractal Softworks page here. It runs on Windows, Mac OS, and Linux. You can read more about the game’s features and planned development in the features section and the faq as well as follow development on the Fractal Softworks blog (which I occasionally post to as well). Additional screenshots and videos can be found in the media section. So what are our users saying? In a recent poll on our Twitterfeed – which you should all be following, because it really is the best way to keep tabs on us – one user wanted to know more about our development process, and the day-to-day decisions behind game development. We hope that this will oblige you, but today’s blogpost is *really* inspired by something from The Internets. 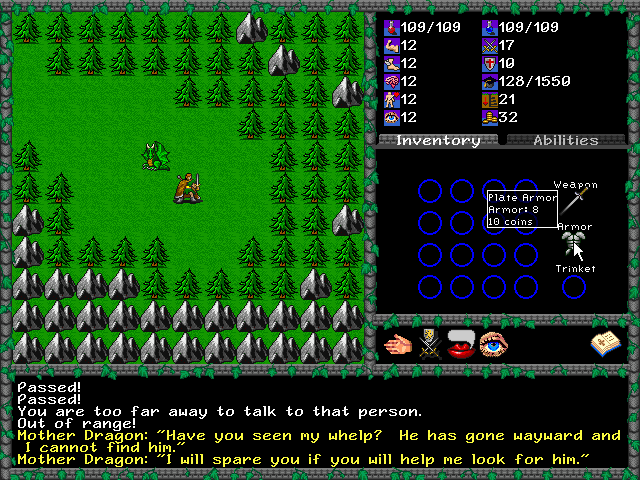 In a recent online discussion about Dungeons of Dredmor, somebody said – and I paraphrase: “Commercial roguelikes will never be as good as free roguelikes because the multi-year, evolutionary development process that results in amazing games like Crawl will never be commercially viable.” Here we have somebody who likes roguelikes, and who should like Dredmor. Hopefully, he will support us – here is a man, after all, who could be a customer, and any failing to attain him as a customer is a failing on our part as a business – but his concern is legitimate. 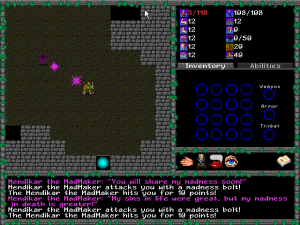 Can a commercial roguelike be as good as Crawl, or Nethack? Well, I think we can… but let’s talk about this. David and I are being interviewed next Wednesday for the “Immortal Machines” podcast over at Colony of Gamers. If you have questions about Dungeons of Dredmor, Gaslamp Games, or anything else that you want to know about, head on over to their forums and get askin’. The best part? Ask a question – if it gets answered, you’ll be entered to win a free copy of Dungeons of Dredmor! Go now! Heed the call of the Wizard-Kings! Dear Linux Community: We Need To Talk. I glanced at Slashdot yesterday while bored and found an interesting article on the CDE packaging tool. An impressive piece of work, CDE automatically packages up all of your dependencies into a self-contained directory structure. If I wanted to package up Dungeons of Dredmor and to be able to guarantee that it would work on your computer, all I would have to do is to run CDE on my computer, where I know Dredmor works, and sha-zam! Instant package. This is something I have been fretting about: how do we distribute Dredmor for Linux?